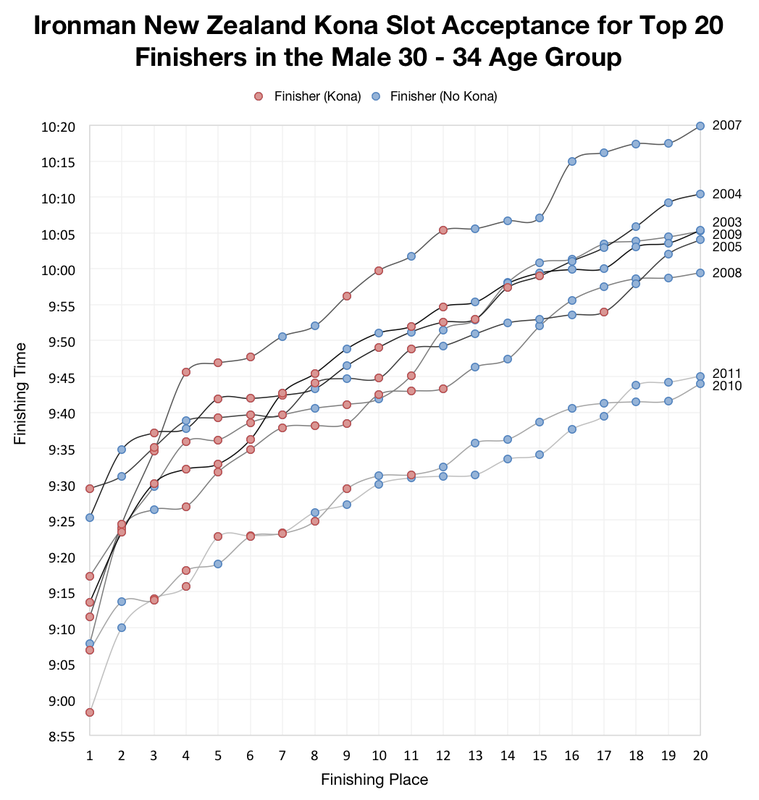 The last Kona slot in the male 55-59 age group at Ironman New Zealand this year went to the 37th place finisher, probably leaving a few late fifties men wishing they’d gone to the roll down ceremony. 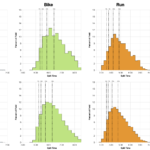 In estimating the likely Kona qualification times for a race the roll down process is completely unpredictable, sometimes – very rarely – a slot rolls a long way, sometimes they’re grabbed by those at the front. The lesson from Taupo is if you want a Kona slot always go to the roll down. 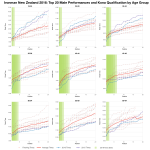 Apart from reminding us that luck plays a role in Kona qualification, Ironman New Zealand offers a rare chance to examine the roll down process. Despite the large number of age groupers who would be interested, for most events it is remarkably difficult, often impossible, to find a list of Kona qualifiers. 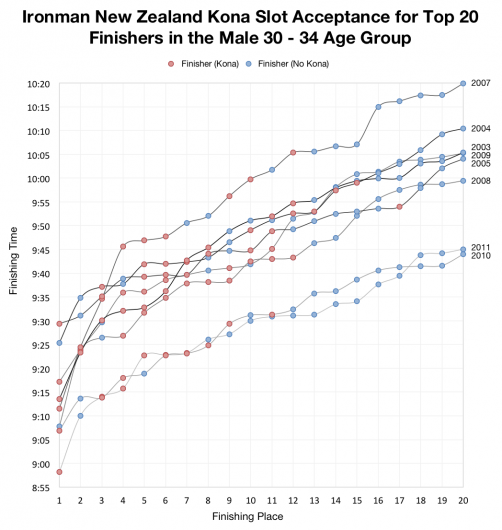 Ironman New Zealand, however, offers records back to 2003 which can be combined with the results data to build a more accurate picture of the qualification process. Naturally I couldn’t resist. My starting point was to adapt the chart of average finishing times for age group placings to show each individual race and indicate whether the finisher accepted a Kona slot or not. In the densely packed male 30-34 year old results shown above it can be a little difficult to read, but it does show that it’s not uncommon for slots to roll from the front of the race. It is however unusual for them to roll far; outside of the top 10 Kona is an increasingly rare thing. 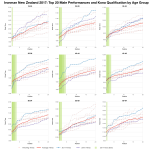 It should be remembered that the number of slots available in New Zealand has changed over the years – older races had more. 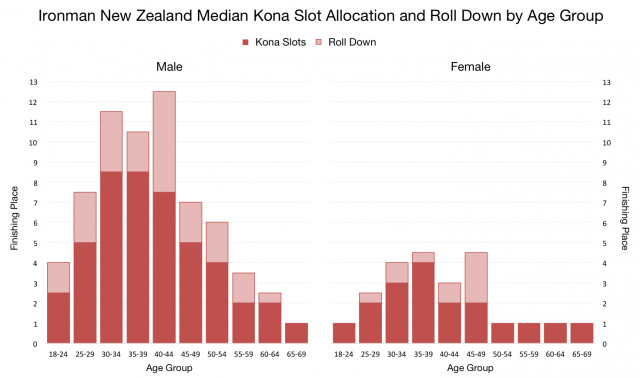 Slot availability also changes in proportion to the size of the age group, as one of the larger divisions male 30-34 will typically have a lot of slots. For contrast here is the same graph for the female 25-29 year old age category. Roll down happens, but with at most two slots available it rarely gets far. As with all the women’s age groups you need to place first or second to be in with a chance of going to Kona. Much as I like the graphs above they are relatively time-consuming to produce and too detailed to appreciate the broad picture. Instead I need to look at what happens on average (or in the next case on median) to see how many slots there are for each age group and how far they roll. The chart below attempts to summarise this information. 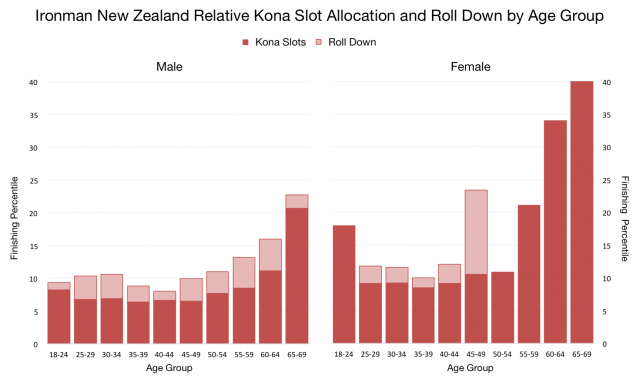 It gives a fair indication of where there are the most slots and the most roll downs, unsurprisingly the two go hand-in-hand: the more slots available the more chance there is they will roll. If there are a lot of slots in your age group it looks to be worth going to the roll down, just in case. The problem with the above is two fold: firstly it doesn’t account for the variation in slot numbers available and secondly it doesn’t account for the variation in age group size (and hence competition for slots). To factor for this I calculated the percentage of the slots each age group received and then, assuming (it’s a big assumption) that the roll down is proportional to the number of slots, I adjusted those numbers accordingly. Finally I converted these figures into percentages of the age groups to give a relative indication of where you need to finish to gain a slot or be in with a chance of a roll down. Complicated, but the chart above shows that for the main age groups you need to finish within a similar percentage of your age group field to be in with a chance of a guaranteed slot and that, generally, the roll down allows a small margin on top of this. Long roll downs, as happened this year, are too rare to significantly increase the odds outside of the guaranteed slots. Looking at past finish times for top age group placings isn’t a bad guide to qualification, you will need to be in the top 10%. Of course this is evidence from one race and there are many factors that influence slot acceptance: race date, athlete location or finances are obvious examples. Expanding it beyond this scope requires more data. 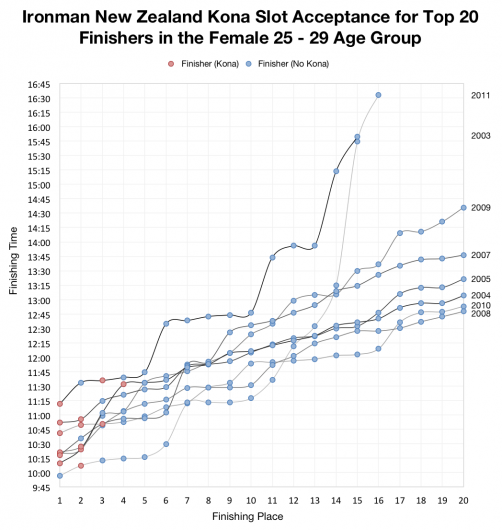 At least in New Zealand we can see most people offered a Kona slot take it.